North Korea claimed Wednesday that it has manufactured nuclear warheads small enough to fit on the head of a missile, an announcement that is likely to rachet up tensions in east Asia, particularly with South Korea. According to Yonhap News, a spokesman for North Korea’s National Defense Commission said that the development of the alleged weapons was part of an initiative to boost Pyongyang’s self-defense capability. If the North’s claim is true, it presents a fresh threat to the security of South Korea and Japan, as well as the United States. Pyongyang has previously claimed that it has the technology to build a nuclear weapon small enough to fit on an intercontinental ballistic missile, which could reach the U.S. mainland. The statement comes days after North Korea claimed that it had successfully test-fired a submarine-launched ballistic missile earlier this month. South Korea had downplayed that announcement, characterizing the exercise as a test ejection, rather than a firing. South Korean officials believe the missile only traveled approximately 110 yards after it left the water, Yonhap reported. The South Korean assessment was supported Tuesday by Navy Adm. James Winnefeld, vice chairman of the Joint Chiefs of Staff, who told an audience at a Washington think tank that North Korea was “years away” from developing the capability to launch ballistic missiles from submarines. 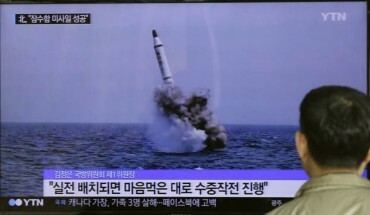 The U.S.-Korea Institute at Johns Hopkins University in Baltimore raised its own questions about the viability of North Korea’s claimed test, saying that images released by Pyongyang may have been altered and raising the possibility that the missiles were launched from a submerged barge instead of a submarine.